Again and again IBM has demonstrated its leadership in the storage industry by inventing and improving function, service support and fault diagnosis. Throughout the 1950s and 1960s, IBM magnetic tape units offered successive improvements to data storage. By the 1970s, the world had begun moving beyond an industrial paradigm into an information age. To improve the operation of tape and move some of its control function out of the central processing unit (CPU), some instructions were first moved to the tape drive. Approximately 1,000 hardware-assist instructions were embedded in the circuitry of the 3420 tape drive. This was the beginning of tape microcode, or embedded instructions, for controlling the tape. 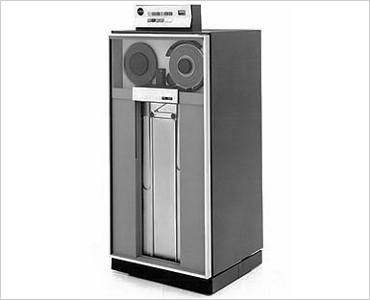 IBM 3420 Magnetic Tape Subsystem The IBM 3410/3430 drives introduced in the early l970s increased that function considerably and also debuted false-symptom codes for real-time diagnosis of problems and failures, a function currently taken for granted on all storage devices. Devices for processing and storing information became increasingly specialized and sophisticated, off-loading tasks to peripherals instead of relying on the CPU. These devices continued to add function and hardware capability so rapidly that within a few generations, what was once considered a mainframe now resided in a peripheral device. Personal computers more powerful than the IBM 701 of 1952 would soon be readily available to the average consumer. The computerization of daily transactions contributed to the explosion of data needing to be stored. Customer expectations for storage grew to encompass better reliability and performance as well as the ability to accommodate additional operating systems and applications. Enter automation. IBM 3850 Mass Storage System IBM produced the first automated tape storage device for information in 1974 -- the 3850 Mass Storage System (MSS). Lessons learned from the MSS led to a new architecture and the first cache-control device, the IBM 3380 Model 11/13, conceived and developed in Tucson, Arizona, in 1984. 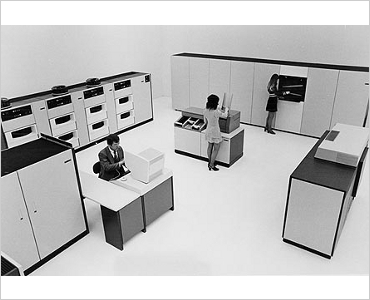 (IBM Tucson had opened in 1978 as a development site specifically for tape, tape heads, tape drives, cards, operational software and microcode.) The 3380, a cache controller for disks, created the foundation for improved storage controllers, which eventually led to the Virtual Tape Server (VTS) and the optimization of both disk and tape storage.